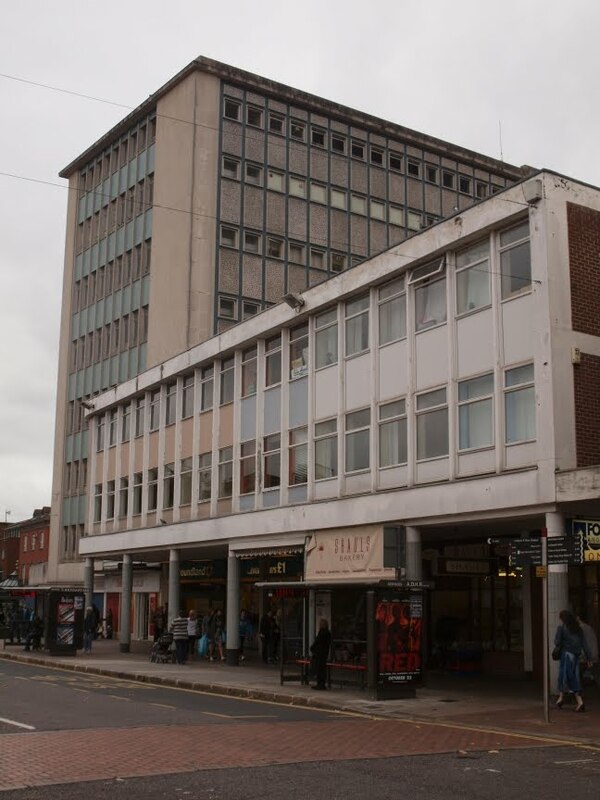 This is one of the ugliest, most inappropriate, most unpopular and abhorrent buildings in Exeter's city centre, although I can think of many others that could also vie for the title. 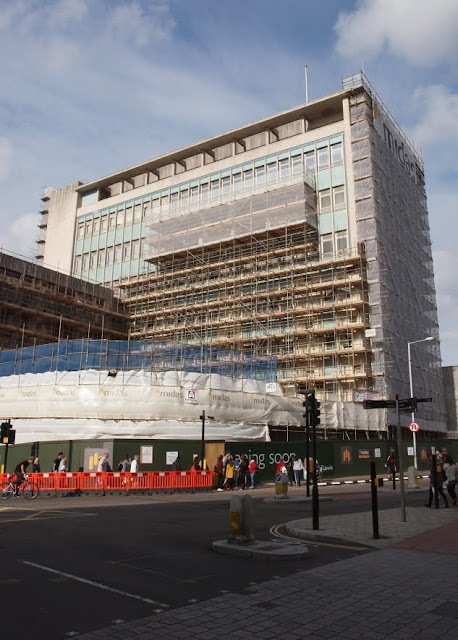 Not only should it never have been built but it is in the process of being tarted up so it can be inflicted on a whole new generation under the guise of a new John Lewis store. 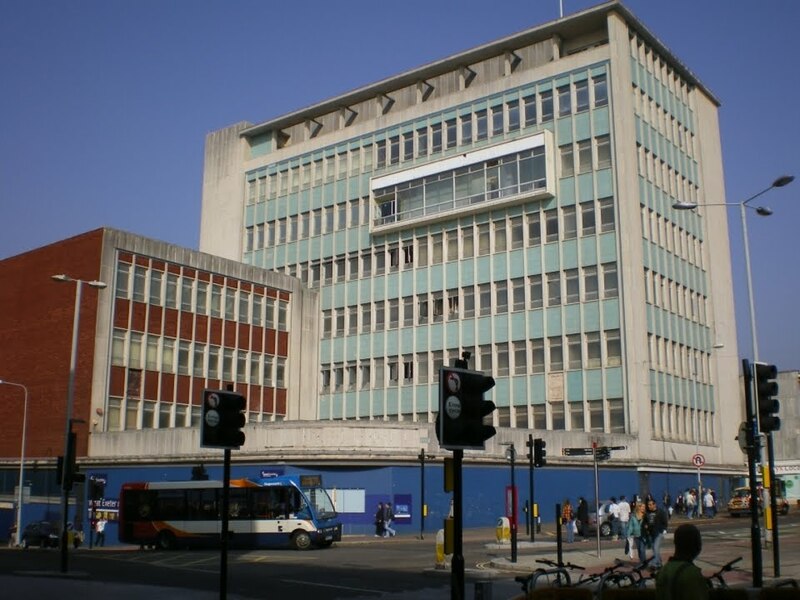 Since its opening in 1964 the seven-storey tower block has squatted on the historically important junction between Longbrook Street, the High Street and, before it was redeveloped out of existence, the High Street entrance into Southernhay. This junction formerly lay just beyond the city's ancient East Gate in the parish of St Sidwell, the three roads meeting close to what was known as London Inn Square. The square had one side open to the High Street. The other three sides were formed by the Royal Subscription Rooms, the New London Inn and a row of properties which curved round into Sidwell Street itself. Apart from the site of the New London Inn, which had already been demolished in 1936, the London Inn Square/Eastgate area was totally destroyed during the bombing raid of 04 May 1942. The map c1900 above right shows the Eastgate junction and London Inn Square. 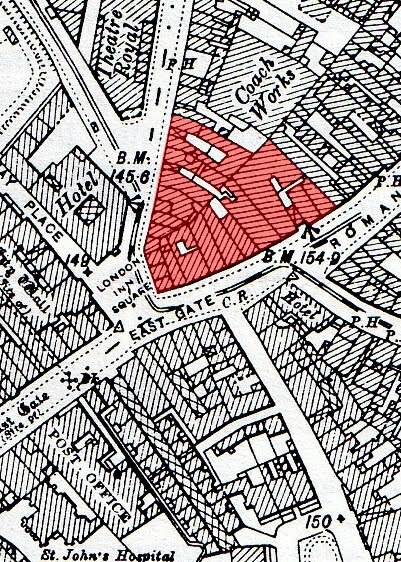 The blitzed area that was to become the footprint of the tower block is highlighted in red but surviving buildings were also demolished to encompass its enormous size. In fact none of the buildings represented by the numerous plots shown anywhere on the map now exist. 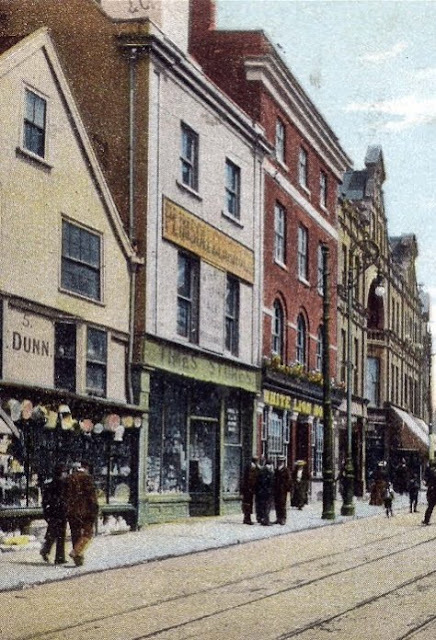 The photograph above shows the view towards the Eastgate Junction from the upper High Street c1900. The buildings highlighted in red occupy what was to become the site of the Debenhams tower block. The Eastgate Arcade and the city's Gothic Revival post office are on the right. All of the properties shown were completely destroyed in 1942, although a significant number survived just out of view in Sidwell Street. The photograph below right shows some of the buildings which stood on the Debenhams site prior to their destruction. Clearly rebuilding was necessary. Exeter's post-war townplanner, Thomas Sharp, was commissioned by Exeter City Council to formulate some ideas for rebuilding the damaged city, ideas that were published in book form as 'Exeter Phoenix' in 1946. Reading the book in the 21st century one is struck by Sharp's optimistic, tentative naivety. He wasn't overly-familiar with the city's buildings or its history and he had some obvious blind spots. He right lauded the remnants of Exeter's Georgian architecture, and proposed the restoration of the townhouses at Dix's Field, but he also advocated demolishing the city's Gothic Revival Royal Albert Memorial Museum in Queen Street, calling it an "architectural horror". But his interest in Exeter's architecture never strayed beyond the merely visual. A medieval house behind a later facade was of no interest. For example, he proposed demolishing the 15th century White Hart Inn in South Street, hidden as it was, and still is, behind its plain stucco exterior. He also suggested the construction of an enormous ring road around almost the entire city, a road which would've run from the above-mentioned Eastgate junction, looping around the base of Rougemont Castle beyond the city walls, down through Northernhay Street (so destroying the early-19th century Iron Bridge near North Street) before it turned and took the course of the present-day inner bypass known as Western Way from the river to Southgate. Apart from a few exceptions, such as the construction of the northern bypass and the demolition of the museum, the city authorities appeared to have rejected Sharp's best ideas and only implemented the worst. In his much-quoted statement, Sharp states: "The way to rebuild a city like this is in sympathetic, not ruthless, renewal". He goes on: "Sympathetic planning in such a case lies in the observance of scale and in the creation of intimate rather than monumental forms". Monumental forms, he suggests, are "empty and meaningless" when used in a medieval town. And so at the Eastgate site, in 1962, work began on the seven-storey monster that was become the Debenhams building, over 120,000 m2 of retail space piled up 140ft (42m) into the air, a "monumental" building which has remained as one of the biggest blots on Exeter's fragmentary historical cityscape ever since. It's tempting to speculate how such a thing ever received planning permission, but then one remembers that this was the same local authority that barely lifted a finger to reinstate any of the city centre's damaged pre-war buildings and which freely knocked down hundreds of the city's buildings in the three decades following World War Two. The aerial photograph above left © Express & Echo shows the completed tower block in 1965. 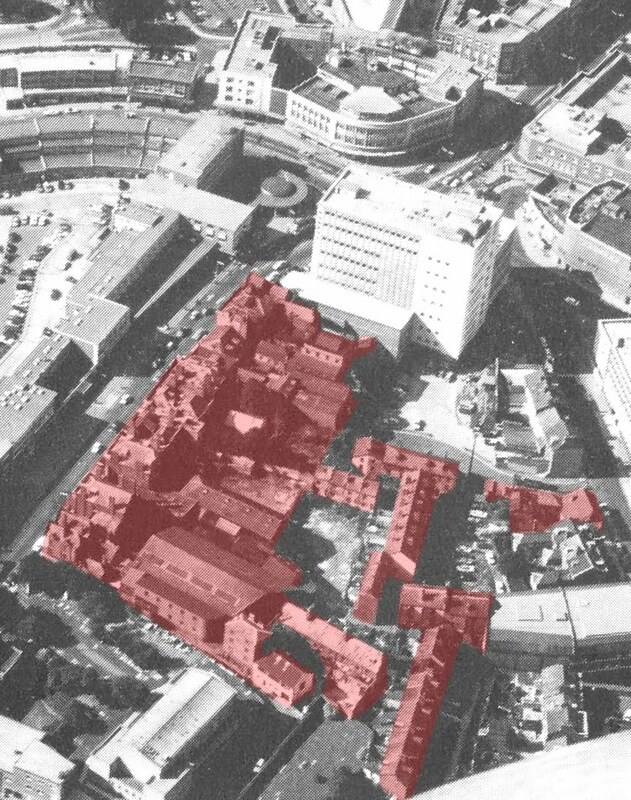 The buildings highlighted in red, most of them fronting onto Sidwell Street, survived the Exeter Blitz intact but were all demolished in the mid-to-late 1960s for yet more redevelopment in Sidwell Street and the construction of the King William Street car park. A similar number of pre-war buildings lined Sidwell Street on the opposite side until they too were demolished for redevelopment in the 1950s. 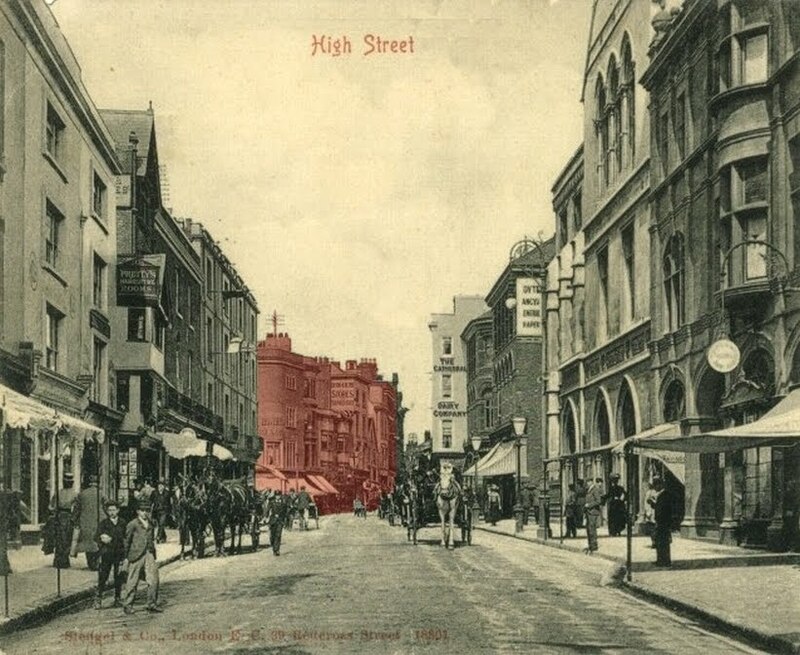 The photograph above shows the view c1955 after the destroyed upper High Street was widened and rebuilt but prior to the construction of the tower block. Visible in the distance are the side walls of the properties that remained in Sidwell Street but which were demolished in the mid-1960s. The sheer inappropriateness of such a building just beyond the city walls of Exeter is breathtaking. This is the place where William the Conqueror gathered his army and laid siege to the rebellious city in 1068, where Perkin Warbeck attacked the East Gate in 1497 and where Royalist and Parliamentarian forces pounded each other with artillery during the English Civil War. The tower block was 'designed' by George Baines and Syborn and constructed at a cost of over £800,000 before finally opening on 05 March 1964. It was intended to be a new flagship store for Bobby's (the firm's old premises, the historic New Inn in the High Street had been destroyed in 1942). The name Bobby's, only a subsidiary of Debenhams, was dropped in the 1970s and for as long as I can remember (35+ years) the tower block has been known as the Debenhams building. It wasn't even well-designed. The curve of the frontage at street level creates a tremendous wind tunnel effect, the downfall of many umbrellas which can often be seen flapping on the pavement like dying birds. Debenhams vacated the building in 2007 and moved into new premises on the 13 acre, £225 million Land Securities redevelopment at Princesshay, and the hideous tower block stood empty for three years. The city council implied that the tower block's days were numbered prompting great excitement amongst many of Exeter's citizens. It was easy to imagine the cathedral bells ringing out in jubilation as the building was demolished! But it wasn't to be. 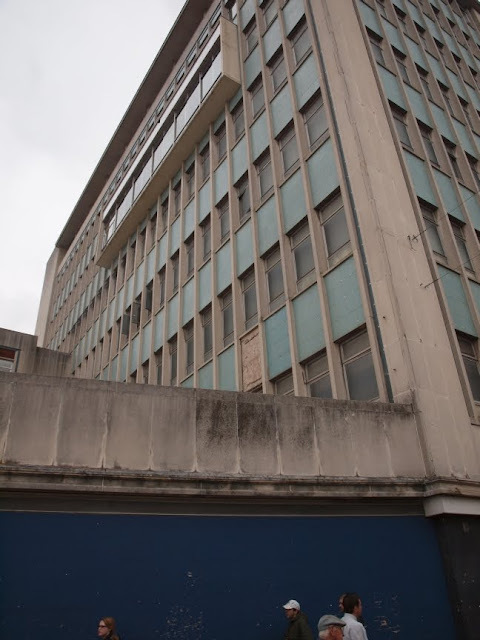 The leader of Exeter City Council, Peter Edwards, stated in 2010 that "the former Debenhams building is a well known landmark for the city of Exeter and it’s great that plans are being explored to give it a new lease of life." It is indeed well-known, for all of the wrong reasons, but to use the word "landmark" in anything like a positive sense would be laughable if it wasn't so risible. Nick Davis, Land Securities Retail Development Director repeated the mistake when he stated that "we remain committed to this landmark building located in Exeter’s city centre and plan to make a significant investment in refurbishing and refreshing the building in preparation for a suitable occupier". Comments sent to the local paper suggested that many people felt otherwise. 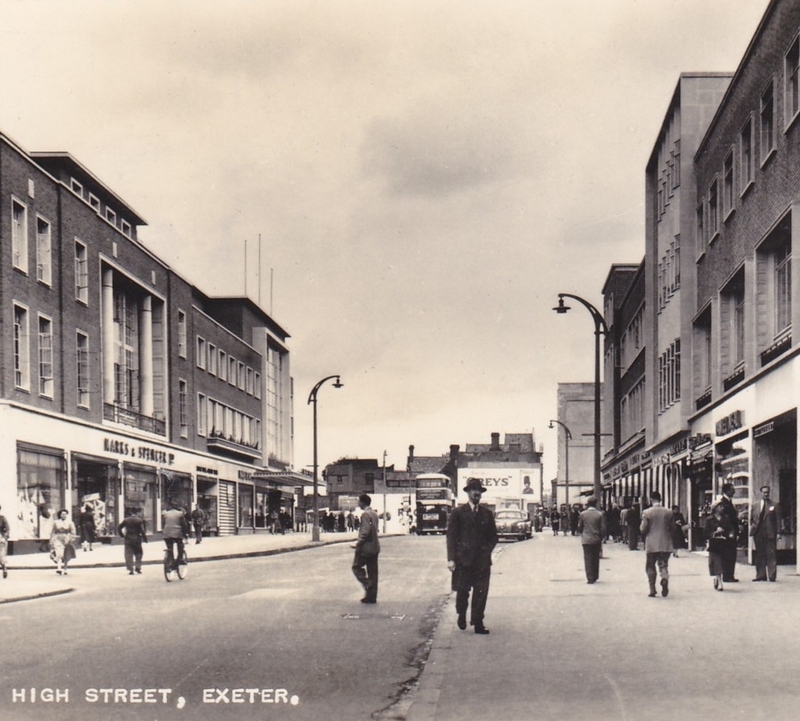 One resident wrote: "I've lived in Exeter all my life and even when the building was in use it was a blight on High Street. It's an ugly concrete block and the best thing to do with it is pull it down and build something (anything) more in keeping with the rest of High St. In fact a building site would look better." 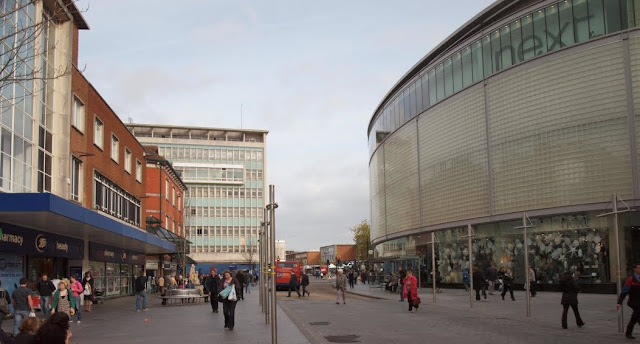 Another local resident added: "I cannot help but think this massive eyesore in the centre of Exeter will always be a sow's ear with no hope of a silk purse emerging, regardless of the money that might be spent attempting to make the transformation. Surely demolition and tasteful rebuilding is a better option?" And another: "Flatten it and grass it over. Bloody eyesore it is". Someone else who had watched the original tower block's construction commented that: "The centre of Exeter has become such a mess compared to our expectation as we watched it being rebuilt". Perhaps it was the construction of the tower block that caused Exeter's renowned 20th century historian Professor W.G. Hoskins to state in the early 1960s that "the post-war rebuilding of Exeter has been a disaster". It is deeply ironic that having demolished so many buildings over the last 50 years the city council has decided to keep the one building that was desperately in need of removal. In November 2010 it was announced that the city council's Holy Grail was arriving in Exeter. John Lewis, allegedly the UK's "most popular retailer", was finally opening in the city and had chosen to use the old Debenhams tower block for their new store. The building is currently under scaffolding right as the exciting makeover takes place. The city council is to spend £250,000 on pimping up both the equally grim King William Street car park at the rear of the tower block and the footbridge that provides direct access from the car park into the back of the building. A report on the BBC in July 2011 reported that the total expenditure on improvements to the road system around the new John Lewis store, combined with the work on the car park, will cost a colossal £2 million. The structure will actually be larger than it is at present as two extra floors are being added to the front of the building. There are also frankly bizarre plans to have a "European-style piazza" overlooking the area on the opposite side of Sidwell Street. I must admit that I don't actually care what happens to the building. Exeter's architectural ship sailed out of port a long time ago, and the tower block is after all just one appalling building amongst many others. Its removal wouldn't greatly enhance those which remained. The only advantage would be an improvement in the view of the city as you descend Pennsylvannia Road. The monumental tower block has recently spawned offspring nearby in the bulbous shape of the vast new Next building which now crouches on the opposite corner of the Eastgate junction and which dominates the eastern end of the High Street almost as much as the tower block, below. I'm from Exeter and while I have had mixed feelings regarding this building over the years, I now think it would be a mistake to destroy it. While the Debenhams Building may not be the best example of a 1960s tower, it is a solid well-constructed building in which a vast quantity of materials were used and many man-hours of work went into. To destroy all this material and work would be extremely wasteful. Aesthetically, I prefer its sober dignified austerity to the tacky 1980s buildings in London Inn Square and the somewhat bizarre new Next building. Finally I will say that the High Street needs a large building at its end to provide visual closure. If the tower was gone all you would see would be the shabby old Victorian buildings round the back and the grim concrete strip of Sidwell Street. While Exeter still maintains many beautiful areas, I agree with you that this part of the city is beyond repair as far as historic architecture goes; but it can still be a smart, clean modern functional cityscape, which I hope the road layout changes and John Lewis refurbishment will achieve. Apparently one of the reasons the building is staying is because it's full of asbestos. I agree that the High Street needs some sense of closure, and no-one would want to look up Sidwell Street unless they had to, but a seven-storey tower block was never the way to achieve it. I can see where you're coming from though. The High Street does needs some closure because of its post-war widening. If it had retained its original width/height ratio then this in itself would've prevented the sense of visual sprawl that would occur now if the tower block was demolished. In some way the sheer vertical thrust of the tower black replaces the strong vertical lines of the pre-war buildings and acts as a balance to the horizontal, monolithic nature of the post-war structures. As I said in the post, I'm not really bothered if it stays or goes. If the future of architecture in Exeter is symbolised by the Next building then there seems little point demolishing one eyesore and replacing it with another (and I do believe that the majority of people in the city would regard the old Debenhams block as an eyesore). The Next building would look more at home in a retail park on the outskirts of Swindon. How it ended up on the corner of the High Street and Paris Street is a mystery. Thanks for your comment. It's good to hear from another Exonian! I used to work in the store in the 70's and early 80's. The big problem is getting customers up above the first floor, there are 7 trading floors! The floors above the 3rd floor are quite small as well. So I am surprised that John Lewis are taking it on, and it will be interesting to see how they tackle the problem. I cannot remember the full history of the building, but when I worked there, we were told that Bobby's has taken on the building, which originally was intended as an office block. Certainly, I can't believe any retailer would consider it a good idea to attempt to get customers to assend 5 floors above ground, and foot fall on the upper floors was always a problem. This is why they tried putting popular depts like toys on the 4th floor to tempt customers up, but they did not like it! Planning permission had been gained to extend the upper floors out over the curved part at the front, but Bobby's / Debenhams never found the considerable amount of money required to make these improvements. Also, a high speed lift to the restaurant was planned for the Sidwell St side of the building, but again, this was never completed. I have fond memories of the place, so would be sad to see it go, even if it was a mistake to build it. It has become a famous part of the Exeter skyline. I wish JL the best, and maybe the face lift will at least make the tower look easier on the eye. Certainly, it will be a very visible landmark for them, as it was for us. Everyone knew where to find Debenhams, Exeter branch! Hi Tim. Wasn't kitchenware up on the top floor? I remember going up there sometimes and it was deserted, and you either had to wait for one of those lifts to trundle you up to the top or spend an age using the escalators! (or using the stairs...) The best thing about the building were the views from the restaurant, and if you were inside it then you didn't have to look at it. 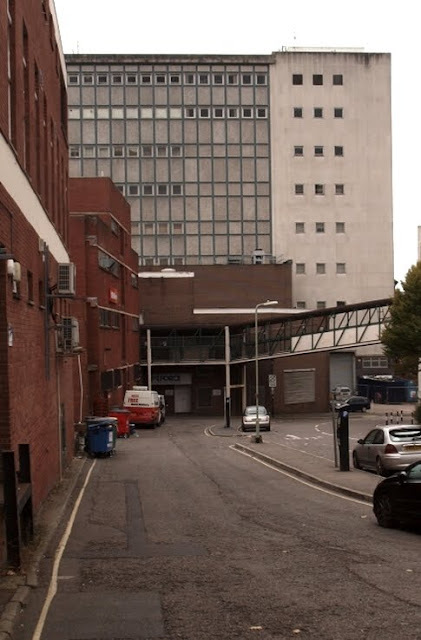 I agree that it's now part of the Exeter skyline, but the fact that such a structure could find a home in Exeter speaks volumes to me about the architectural depths to which the city has sunk since 1945. Can you imagine such a thing in the middle of York or Salisbury, Canterbury, Lincoln or Winchester? It really should never have been built, but given the rest of Sidwell Street, the upper High Street, Paris, Street, South Street, etc. does it really matter if it goes. Probably not. It's a bit like Renslade House in many ways. That whole side of the city between Cowick Street and Fore Street has been so totally decimated by the inner bypass that it wouldn't make much difference if Renslade House stayed or not. I too am surprised that John Lewis are moving to the old Debenhams building. I imagine they're relying on a massive redevelopment of the bus station area. I don't personally think that the city's road system should be screwed around with to accommodate JL though. Driving around Exeter is hellish enough as it is without making more roads one-directional or closing them entirely. Thank you for commenting! I too used to work in Debenhams, (hello Tim!) so I have many fond memories of the building. As an Exeter girl, I grew up with this skyline. Agreed, It is an eyesore, but it's OUR eyesore! Many of us associate the building with childhood special treats in the restaurant and as a popular place to meet with friends. I would be quite sad to see it go. Hi Wolfpaw and Hi Denise! Yes Wolfpaw, Cookware was up there, but there were many changes to tempt customers up there. Soft Furnishings, Toys and the Christmas Grotto, Sports, Stationary, Carpets, Customer service (for exchanges and refunds), Gardening, Fashion clearance, etc, have all been guests of the 4th floor during my time at Debenhams, but I expect there were others. Any guesses on what John Lewis will try first?! I don't know what John Lewis will squirrel away on the 4th floor. I do know that the whole city is supposed to be quaking in excitement at the prospect of John Lewis pitching up but I doubt I'll ever step foot inside. Unless you're into shopping for clothes or shoes, Exeter has very little to offer in the way of interesting retail experiences. Any books, CDs or DVDs I want I usually order online. The only difference between the centre of Exeter and Cribbs Causeway in Bristol is the fact that Exeter has a Gothic cathedral stuck in the middle. 21st century Exeter is a giant open-air shopping mall with a few historic buildings stuck around the edges. Admittedly many cities in England are the same but the point of my blog, hopefully, is to try and show that Exeter was once so much more than that. Another problem with shopping in Exeter is that nearly all of the shoppers are funneled into the High Street and Princesshay. Who really goes ambling down Paris Street, South Street, North Street or Sidwell Street looking in the shops? So there are literally thousands of people crammed into a relatively small area, the consequence of which, for me, is an unpleasantly frenetic and crushed environment. Throw in the buses trundling down the High Street and Queen Street and I personally find it all pretty grim. I guess a lot depends on what you want from a city. For me there should be more than countless chain stores and shops. I've lived in Exeter on and off for nearly 40 years and grew up here. Exeter is *my* city and it always feels like home when I return after being away, but I can't pretend to be anything but totally critical of its current incarnation. I find the 20th century history of Exeter as fascinating as it is deplorable. I can see what you are saying wolfpaw. As a retailer myself, and a sales / marketeer all myself, I am not the right person to deplore the situation in Exeter. The massive catchment area and resulting revenue and prosperity this brings Exeter, would be hard to replace if the shoppers went away. The planners certainly ran amok in the 60's, and short of buldozing the town centre and starting again, Exeter has what it has now, and maybe can replace bits in the future. WW2 has a lot to answer for as well. I do not live in Exeter at the moment, but used to visit the "back streets" and explore the privately owned shops when I worked in the city. I wonder what can be done to attract the shoppers away from the centre, and find what they are missing. On the busses front, have you visited Oxford city centre? Total bus nightmare, as it costs £30 to park per day in Oxford, so most use the park and ride's etc. The city centre Architecture is hidden by the masses and the barrier of buses. It's not just an Exeter problem, but not much comfort for you! Good blog by the way. I am strongly in favour of keeping what was the Debenhams building. I completely agree that it is architectually hideous but I also think it has become an important landmark in Exeter. Plus, there are few other buildings that serve as such an excelltn visual reminder of the damage done to the city during the rebuilding process. For information, there will be a new restaurant on the 4th floor. Escalators and / or lifts will take shoppers from the ground floor to 4th floor. And no the reason the building has been retained was not due to asbestos (albeit this has been a well documented issue. I worked as a waitress in the restaurant at Bobby's in the '70's and I can tell you that it does have one redeeming feature - the view from the top! This is a fascinating page. Thank you! I'm a local filmmaker who usually works on corporate stuff for corporate clients, I'm also a lapsed Exonian (just returned after 7 years away), my mum still calls the building Bobby's. The story of this place interests me a great deal; I was always in the eye-sore pull it down camp but I think it's a great piece of recycling - so often are old buildings just pulled down - and the new store is shaping up well and will no doubt be far better than the mediocre Debenhams in Princesshay. Hi Will. I must get around to doing an update on the former Debenhams building as it has changed quite a bit since I wrote about it. I agree that the recycling aspect is commendable. I guess what sticks in my throat is the fact that over the last 60 years the local authority has pulled down hundreds of buildings of greater visual and historical value with no thought to recycling them. For me, it just seems ironic that such a monstrosity should get a second lease of life when so many others have fallen by the wayside. But clearly some people are deeply attached to the building. Good luck with the documentary! I lived in Longbrook Street for some years, almost in the shadow of that horrid building - it dominated the skyline and when I heard a rumour, that it was going to reduced in height I was delighted - unhappily the rumour was false -and its now being 'glamorised' with glass and steel ! Its a great shame because it is a monstrosity that draws the eye away from the beauty of the Cathedral - which was once the focal point of the the city's skyline, particularly from any distance, as was intended when it was first built all those centuries ago. I just realised 1, St Sidwell is where my ancestors were after living in North Street, early 1800's, but I doubt any of the pics are as early. I think at that time the place was gradually getting new brick houses of the newer better off tradesman? Interesting to see what the site became!